Over the past few years I’ve received countless emails, Tweets and phone calls from therapists with questions about starting and running a cash based practice. I’ve had the privilege to work one on one with some excellent therapists who are now venturing out on their own with this practice model; but, I can only help so many people at a time that way. I’m excited to launch my first Webinar designed to help you create the practice of your dreams. 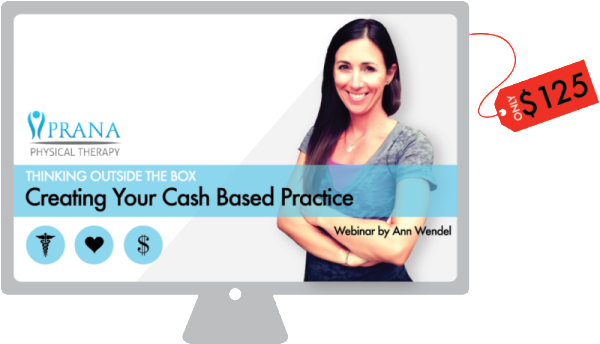 Thinking Outside the Box: Creating Your Cash Based Practice was designed to answer your questions. Whether you’re starting a new 100% cash based practice, transitioning from an insurance based to cash based practice, or looking to add cash based services to your existing practice, you’ll find what you need here. PS In Vermont I can legally practice massage in all these ways since they do not require any licensure or certifications. In all of these areas I have received substantial training. I am a confessed continuing education junkie.